Franchising is a complex area of law. There are both opportunities and dangers for both the franchisor and the franchisee. Franchisors are required by law to fully inform prospective franchisees about the franchise and franchisor, using a Franchise Disclosure Document (“FDD”). If you are franchising your business or looking to buy a franchise, an experienced franchise attorney can assist you through the process. A franchise attorney can help you review already-drafted franchise documents, or prepare the necessary franchise documents, depending on your franchise needs. The franchise team of attorneys at Denton Peterson provide franchise-related services to our clients including preparing FDDs, preparing franchise agreements for single unit and regional franchises, guiding clients through the state registration process, counseling on compliance with all elements of disclosure regulation, assisting in the initial formation of franchise entities, working with franchise consultants, preparing addendums to franchise agreements, assisting in franchise terminations and transfers, and counseling clients on compliance with federal and state regulation. We give flat fees and firm deadlines for most of our franchise work. Our franchise clients know exactly what they are getting, and we keep our commitments. We often work closely with the clients’ advisers including accountants, brokers and consultants. In our initial meeting with prospective franchisors, we address most of the critical issues for the start-up franchisor, including the structure of the proposed franchise. We help clients determine what type of franchise they will offer – unit franchises, area representation franchises, or some other type of franchise structure. We use our proprietary questionnaire and initial meeting with our clients to discuss their goals and objectives. After the initial meeting, we then draft the appropriate documents in accordance with federal and state laws. 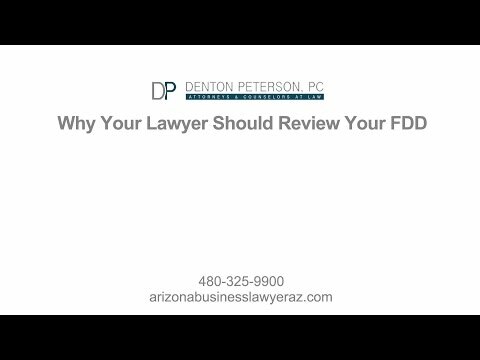 The Mesa attorneys at Denton Peterson are experienced in drafting franchise disclosure documents. We walk our clients through the disclosure requirements. The franchise disclosure document (FDD) includes 23 items or sections and is a lengthy document. Some of the information required in the FDD is the litigation history involving the franchisor or its officer, disclosure of parent and affiliate companies, initial and ongoing costs of the franchise, training and advertising information, disclosure of current and former franchisees, financing offered by the franchisor, and financial information with audited financial statements. The FDD also includes several exhibits including sample franchise agreements, the table of contents for the operations manual, financial statements, and other sample agreements. We also advise clients about making financial representations in the FDD and the added risks of doing so. We get to know our franchise clients throughout the process in order to make the correct disclosures about their business. In addition to preparing the FDD, we assist clients in registering franchise offerings in the various registration and business opportunity states when necessary. The following are registration states: California, Hawaii, Illinois, Indiana, Maryland, Michigan, Minnesota, New York, North Dakota, Rhode Island, South Dakota, Virginia, Washington, and Wisconsin. The process to register varies state by state, but most registration states require that the FDD be filed and approved by the designated state agency before a franchisor can offer or sell a franchise in that state. We have helped clients register their franchises in each of the registration states. Registration states require franchisors to file a renewal application each year. When requested, we notify our franchise clients when their registrations need to be renewed. We help our clients gather necessary information for renewal and assist them through the renewal process. Franchisors are also required to revise the FDD within a reasonable time to include any material changes. We help our clients prepare and file amendments to their registration when changes occur in their business structure or when material changes arise relating to their franchise offering. In addition to registration states, some business opportunity states have laws that may require franchisors to apply for authorization in order to sell their franchise. Our Arizona business lawyers help clients file the appropriate applications in the business opportunity states that they plan on selling their franchise in. After registration is complete, we continue to help our Mesa franchise clients sell their franchise by assisting in negotiating franchise agreements with prospective franchisees and helping resolve franchisee disputes that arise from time to time. We also advise our clients about their options when working with non-compliant franchisees, including the option of termination. We are experienced in creating franchise entities. We help clients file the appropriate formation documents, draft an operating agreement, and obtain an EIN from the IRS. Our attorneys are experienced business law attorneys and can assist you with the creation of a franchise entity. As part of the franchise process, we help clients file for and register their trademarks with the United States Patent and Trademark Office. Our Mesa franchise attorneys can walk you through the USPTO registration process and help you file the correct applications and documents required. We tend to develop a close working relationship with our franchise clients because of our firm’s small size. We have successfully helped many franchisors get started and continue to support our existing franchise clients in different parts of the United States. Some examples of the franchises we have assisted include numerous restaurant, yogurt, coffee and other food-related companies; a background check company; a successful weight-loss clinic; a specialty toy store; specialty health care companies; a national water company; office cleaning and security companies; a non-ultraviolet sun tan company; and a specialized e-cigarette company. We have assisted franchise clients from all over the United States as well as Canadian franchisors looking to expand in the US. We also have represented numerous prospective franchisees in reviewing franchise documents before purchasing a franchise. We have experience negotiating many franchise agreements (and other related agreements) on behalf of both the franchisor and the franchisee. Please contact our offices for more information about the franchise services we offer and how we can help with your franchise needs. Brad Denton and Elena Cottam have worked together to create many Franchise Disclosure Documents (“FDDs”) and Franchise Agreements for our clients. Our firm has helped many franchisor clients with initial state registrations and annual registration renewals. Brad Denton and Elena Cottam have worked together to help our franchisor clients amend their registration offerings. Brad Denton successfully represented a franchisee client in the sale of all its assets. The franchisee had built a franchise in the education industry and was ready to retire. Brad Denton has interviewed numerous franchisees who are evaluating franchise opportunities. Our representation can involve a simple review, or a complicated analysis and memorandum, negotiations with franchisors, revisions of franchising agreements, and more. Brad Denton has assisted numerous franchisees and franchisors in disputes regarding payment of royalties, violation of franchise agreements, and more.